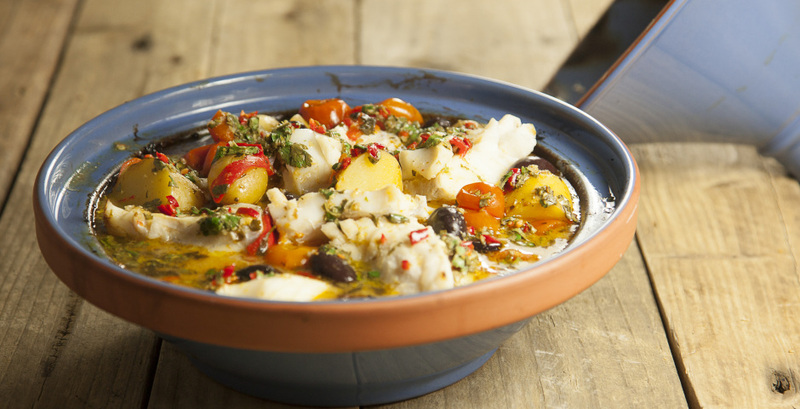 Toss the fish with half the chermoula mixture and leave in the fridge, while you prepare everything else. Mix the potatoes, tomatoes, olives and preserved lemon in an ovenproof tagine or lidded casserole. Add the stock, then season, cover and cook for 40 mins. Add the fish and cook for another 15 mins. Drizzle over the rest of the chermoula to serve. Recipe by Kirsty Hale, Riverford Cooks.